Tonight I will like to share with you a special recipe, Linguine with Truffles. The truffles were hard to get, but I was eventually able to get them specially ordered by Sickles Market in Little Silver, NJ. Watch my video below for step by step instruction on how to cook this recipe! Since this dish only takes a few minutes to cook, you can start boiling water for the linguine. 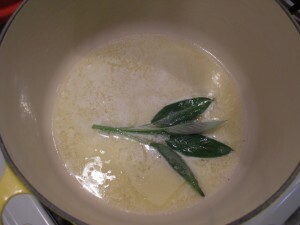 Then you will need to put 6 tablespoons of butter and few sage leaves into a pot, with the heat level on low. 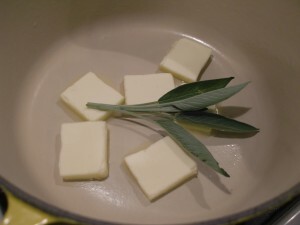 Let the butter and sage cook slowly, letting the butter absorb all of the sage flavor. Once the water starts boiling, add in your linguine pasta.